The more I keep tabs on the feminist political movement the more I find sites like these, as a matter of fact I am starting to see more women who fight for women's right than feminism who fight to elevate themselves above men at the expense of those who are honor bound to be men...It seems to be a sin to them if we open a door, pull a seat, or God forbid be single fathers of our daughters, as what happened to me...I do think that some of the ladies do not know that the feminist movement's hierarchy behave is such a destructive manner that they have a policy that all men are born genetically violent. 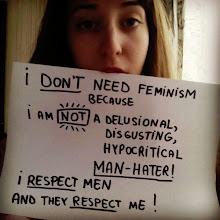 One other thing I have noticed, the feminists seem to thrive on making women who are not on their side as inferior, if you stay home and care for your children while your man is out at work, she is under his control. What if she chooses to be this type of person, according to them, she is inferior? Do I fight for men's rights, I do not believe so, though some might think that, what I found is without the father's involvement in the family, and I mean as fathers use to behave, protecting the honor of our daughters for instance, amongst other things, we are having more teen pregnancy, they become dependent on the welfare system, their kids become dependent and so on...I live in a small town, rampant welfare, even the city officials believe the economic development of the area depends on attracting more welfare recipients from the adjoining cities, in the spring we have a saying, "look at the children pushing baby's in their strollers". Inter-dependency is not a dirty word, I depend on the woman's gift, and she depend on mine, together it is called....FAMILY. The family, man and woman got us from the caves or the garden of Eden, whichever one believes, to this point, we did this together and we did a pretty damn good job, the future depends on us, not one or the other. Oh we can improve, and we will, but not the way left wing campus feminism think it should be done...We can do it...TOGETHER.